Here it´s completely easy for me to specify the source of the recipe. 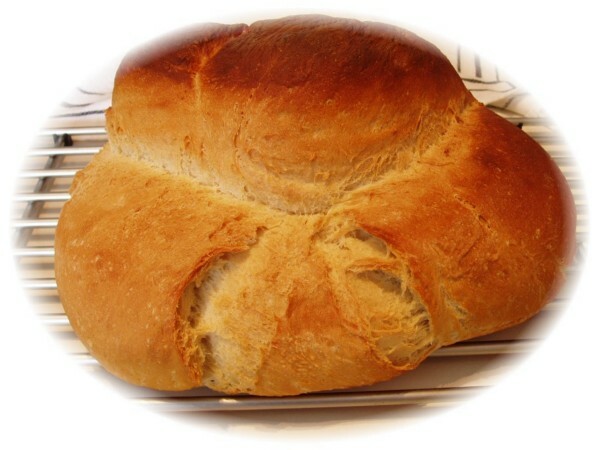 baked bread. It still exist only one old photography from 1960 of the old baker's shop. Afterwards the over 200 years old house, was torn off. Sieve the flour into a large baking dish. Form a hollow, dissolve fresh yeast with the sourdogh in 300 ml handwarm water and give it to the flour in the center. Mix a soft paste with a third of the flour quantity. Cover with kitchen cloths and let it repose on a warm place (room temperature) above 90 minutes. The sponge is finished - if his volume increased and something air in large blisters escapes. Then the yeast performed its work. Now add 30 g salt and the remaining 600 ml warm water to the sponge, mix and knead it now with one hand under the remaining flour. Different flour bind differently much water. When necesarly, add in small quantities flour and knead it proper some minutes. The paste is finished if it separates easily from the soil, when it´s smoothly, flexible and supple. Cover with kitchen cloths and let it repose on a warm place 20 minutes. Dust a kitchen board with flour, present the paste, separate, knead for several bread the paste accordingly, form breads, cover and let it repose on a warm place once again 20 minutes. Preheat your stove till up to 250 °C. Take something paste away for the next sourdogh and keep it on a dry place. Prepare yor baking sheet with goose fat. Place the paste in the middle of it. Sprinkle a little bit with water and push the baking sheet into the pre-heated furnace onto the middle rail. Use only under and upper heat. Close the door immediately and don´t open it, till it´s ready baked.